Do you work smarter on your own tablet, smartphone or laptop? Go for it, says corporate IT. Read this white paper to learn how BYOD is an emerging trend in business policy. In a recent survey 44% of firms have embraced BYOD and another 94% of firms said they will hope to implement one by 2013. 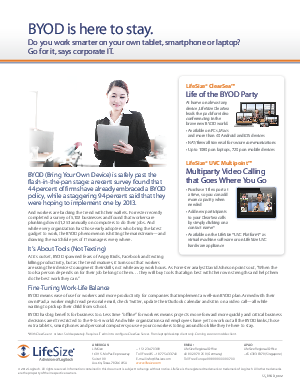 Read this white paper to learn more about BYOD and how LifeSize can make this transition easier for you.